This interview and a mod thing is becoming my new post standard. I can’t post about a mod without posting about an interview at the same time. It’s just impossible. Crayon Physics Deluxe interview at Binary Joy. Ben had a change to play Crayon Physics Deluxe and he asked me bunch of questions about the game, my prototypes and about hot beverages. Apparently this is some kind of an indie interview season: Phil Fish was interviewed at Arthouse Games, Kyle and Ron were interviewed at TIGER Sauce, the Tim has a huge number of indie interviews… Maybe it’s the IGF Buzz. Bloodyhoody created a total conversion mod for Bloody Zombies and it’s set in the Harry Potter world. I’m a total Potter noob so I have no idea how accurate the mod is (I think there isn’t quite that much blood in the books), but the number of new levels in the mod is impressive. There’s over 15 new levels in that mod, so if you’ve played through the original game give Bloody Potter a try. Zelos has created the first The Amazing Flying Brothers mod and to much of my surprise it’s a Super Mario mod. Well it wasn’t really that big of a surprise, because the first mod of my games always seems to be a Super Mario mod. It’s crazy. Well the mod is a whole lot of fun, with new sound effects and graphics. Check it out. I got a lot of comments saying that playing Crayon Physics on a tablet PC was loads of fun. I never had a change to test it. Until now. I got my hands on a tablet PC and while it was fun to play Crayon Physics on it, it was way more fun to play Crayon Physics DELUXE on it! Here’s a little video of me playing Crayon Physics Deluxe on a tablet PC. The game is still very much in development and the levels here are in a random order. I’m not even sure if these levels will make it to the final game. I got interviewed. Again. Read it over at the Gamasutra.com: Road To IGF: Crayon Physics Deluxe. They interviewed me because a little over month ago I submitted Crayon Physics Deluxe to the IGF. I mainly did it to get even with Jetro; my goal is to beat Cinnamon Beats with 10 points (no more, no less). They asked me what was my motivation behind creating the game. I had to lie, because I was afraid they might disqualify my game if I told them that I only did it to get back at Jetro. 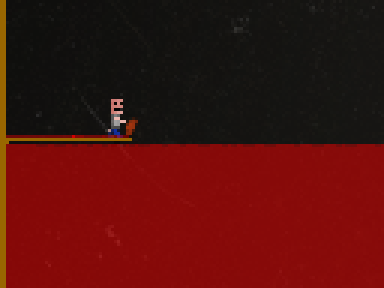 In the other news there’s another mod for Bloody Zombies. It’s called Bloody Halo and (surprise surprise) it’s set in the Halo universe. You play as Master Chief and slash through enemies with your power sword. It’s not as “professional” mod as Bloody Goombas, but still it’s fun and very playable. It was done by juju02 over at the fun-motion’s forums. Download Bloody Halo from here: Bloody_halo.rar (0.5 MB). Well, it’s only been four days since I released Bloody Zombies and ShortStuf7 aka Tom Carroll (from fun-motion forums) has already managed to create a total conversion mod of the game. And it’s a pretty sweet Mario themed mod with modified levels. Play as Mario in an epic quest to save the princess! Kill Goombas with your turtle shell to collect coins and go through the pipes! You can download the Bloody Goombas mod from here: Bloody_Goomba.rar (0.5 MB). It’s a stand alone mod, so it’s pretty easy to get working. The first custom levels to Crayon Physics were also Mario themed. I’m not sure why is this, but apparently everybody thinks my games would be much better if they featured Mario. *Hint* *Hint* *Wink* *Wink* to possible Nintendo managers reading this. Oh and please don’t sue me or Tom. I’m kicking off the new season with a low resolution game done for the Gamma 256 event. The deadline is today, but really this game should have been released yesterday, when it was Halloween and Peter Jackson’s birthday. All I can say in my defence is: Party’s over! 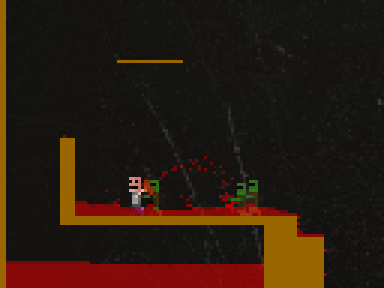 Bloody Zombies, the goriest game ever made in the glorious 128 x 96 resolution! Fight zombies with your lawn mower! Solve levels with your opponents blood! 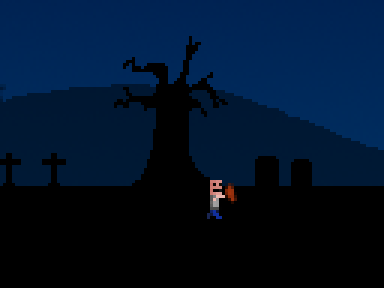 Goal is to rescue Barbara from the clutches of the nasty zombies. Collect all the keys in the level to open the door to the next one. It’s recommended to play the game with a Xbox 360 controller. But it’s also playable with keyboard and mouse. [right thumb] controls the lawn mower. [right trigger] gives gas to the lawn mower. [Mouse] moves the lawn mower. [Left mouse button] controls the gas. Esc will quit the game. Settings.xml can be tweaked to run the game in fullscreen. The game runs in 128 x 96 resolution, but for obvious reasons the game area is zoomed. The zoom factor can be adjusted in the settings.xml. It’s under the title PixelSize. PixelSize 1 runs the game in it’s native resolution. You are currently browsing the Kloonigames weblog archives for November, 2007.